Social giant will donate £3m to Citizens Advice and set up dedicated team to combat fraudulent ads. 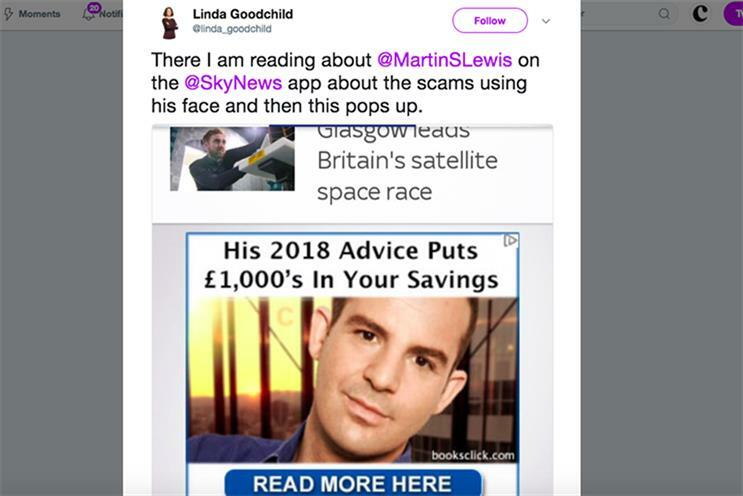 MoneySavingExpert.com founder Martin Lewis has dropped his legal action against Facebook and is backing the platform’s launch of a scam-ad reporting tool. Lewis sued Facebook last year for failing to prevent and remove false advertising that used his name and image to lure vulnerable people into costly scams. Today, the TV presenter and advice columnist said he would drop the lawsuit after Facebook pledged to donate £3m to set up a Citizens Advice Scams Action project that will launch in May. The funding will allow the charity to independently undertake scam prevention work, focused on identifying and tackling online scams in the UK. The £3m donation will be made up of £2.5m in cash over the next two years and £500,000 in Facebook ad credit coupons issued in tranches over the next three years. Facebook has also promised to create a dedicated internal operations team who will be specially trained to handle these reports, as well as investigate trends and potentially remove ads that are found to be scams. It will also launch a scam-ad reporting tool that will allow Facebook users to "easily and quickly" report suspicious ads. Lewis said: "It shouldn’t have taken the threat of legal action to get here. Yet, once we started talking, Facebook quickly realised the scale of the problem, its impact on real people, and agreed to commit to making a difference both on its own platform and across the wider sector. "The amount being donated to set up the Citizens Advice scams action project is far above anything I could’ve won had I succeeded in a court. That shows Facebook’s determination to change things." The move marks a change in moderation policy for Facebook, whose terms already demand that ads on its platform must not contain deceptive, false or misleading content. It employs 30,000 content moderators globally. Daniel Gilbert, chief executive of Brainlabs, said the project launch was a welcome improvement to the platform but insisted that Facebook could still do more to crack down on ad scams. "How refreshing to see a constructive joint solution between two parties like this," Gilbert said. "But it’s not ambitious. Remember this is a company that is able to identify everyone by their face. The logical bridge of transferring that type of technology to monitoring image rights shouldn’t be difficult." Lewis also called on major online ad platforms, including Google, to "follow Facebook’s lead" and support the CASA project. After launching the legal action last year, Lewis criticised media owners such as Sky News and The Guardian for publishing fake ads that were served with Google’s AdSense platform. A Google spokesman said in response: "Because we want the ads people see on Google to be useful and relevant, we take immediate action to prevent fake and inappropriate ads. We have a tool where anyone can report these ads and these complaints are reviewed manually by our team. In 2017, we removed 3.2 billion bad ads and we’re constantly updating our policies as we see new threats emerge." Facebook, meanwhile, admitted today that "there is no silver bullet" to policing scam ads, particularly as fraudsters continue to adopt more sophisticated techniques. Steve Hatch, regional director for northern Europe at Facebook, said: "We’re grateful to Martin Lewis for bringing attention to this important issue and for his guidance over the last eight months. "Our donation to Citizens Advice and our launch of a new UK scam-ad reporting tool and dedicated operations team for this reporting channel is part of a wider commitment to tackling scams and to ensuring people are given more transparency and controls over the ads they see on Facebook." Editor's note: this story was edited at 3.30pm to include Google's comment.